Acucraft loves working one-on-one with our customers to make their fireplace dreams come true! Equal to this is hearing how our customers are enjoying their fireplaces. The seaside town of Blaine, WA is located on the northwest corner of Washington State near the Pacific Ocean and Canadian border, and it is the second busiest border crossing in the United States. Blaine, WA is also the location of one of the newest Starbucks Coffee. Recently we received word from Mike Hill of Otis Investments LLC who worked with Acucraft to build his Custom Outdoor See Through Gas Fireplace residing at Skyehill Station outside the Starbucks Coffee in Blaine, WA. Acucraft Fireplace Advisor Mark Kennedy and one of our skilled Fireplace Designers, Adam Redberg worked one-on-one with Mike through the development, design, building, performance and safety certification testing and delivery of this huge custom outdoor see through gas fireplace with 10-foot logset. Mike referenced his travels around the United States, Canada, and Europe. He had seen many impressive and huge fireplaces in public areas, but the logs and flames weren’t in proportion to the size of the fireplaces. “They just didn’t look correct,” Mike said. The Acucraft custom outdoor see through gas fireplace built for Mike features a 10-foot long, custom built and painted driftwood logset with a total 31 logs. “They delivered on time, on our budget,” says Mike. People are taking their Christmas pictures in front of the Acucraft outdoor gas fireplace. 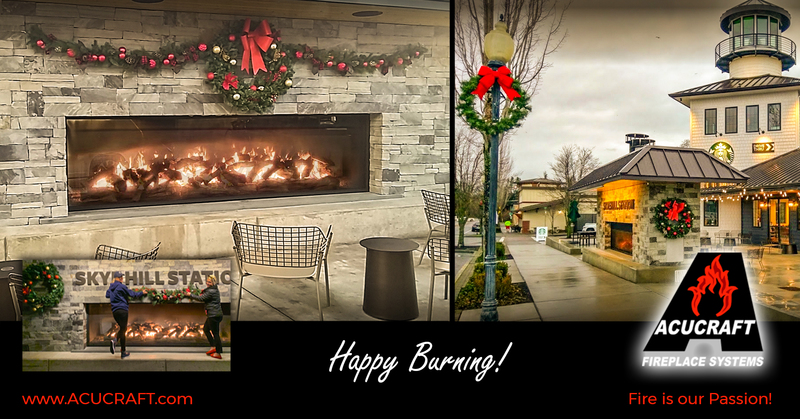 Now that the Starbucks is open and warming people up from the inside with their delicious coffee, the Acucraft outdoor gas fireplace is drawing attention. Adding to the fireplace ambiance are the functional performance and safety features. The fireplace boasts the tallest flames on the market that produce 300,000 BTUs/hr. and is safely sealed with glass and a custom firescreen. “The heat comes out nice and warm,” says Mike. Kids can safely touch the fire screen and glass without getting burned. The Acucraft custom outdoor see through gas fireplace is located in front of a new Starbucks that has a 50 ft light house in it. This new Starbucks location not only has a 48-foot-tall lighthouse tower, but it has a magnificent spiral staircase, an expansive coffee lounge and a sunny patio where you can enjoy your morning coffee next to an impressive see through outdoor gas fireplace with a 12′ wide x 3′ tall viewing area! It was a pleasure working with Mike on this truly one-of-a-kind project. We hope everyone in the quaint seaside town of Blaine, WA has the opportunity to enjoy a hot cup of coffee next to the dancing flames of this unique outdoor fireplace. Happy Burning and Merry Christmas from The Acucraft Team!